Sikkim, in case you hadn't noticed, doesn’t exist anymore; it was annexed by India in 1975. China’s longstanding claim was that Sikkim was an independent country. With a population of only around 600,000 [according to the 2011 census, 250,000 people in 1971] and limited local industry, the state relies heavily on federal grants. Sikkim has been one of the very geo-strategically significant border posts of India and has a huge concentration of security and military forces. Besides the other issues related to carrying capacity, the physical burden of these forces as a pressure on land and other natural and manufactured resources are quite gigantic. This definitely needs to be taken into consideration. All these incur a huge development and environmental cost to the State, which many other States in India do not have to incur. In the absence of any meaningful economic valuation of these costs, there has been a tendency to over exploit physical and other resources of the State without any systematic replenishment. In 2011, the government launched a pilgrim center comprising replicas of four of the most-important Hindu pilgrimage destinations popularly known as “char dham” or the “four abodes.” Devout Hindus believe that a visit to the “char dham” will help them atone for their sins and pave the way to heaven. The Statue of Guru Rinpoche, the patron saint of Sikkim in Namchi, is the tallest statue of the saint in the world at 36 meters (120 ft.). Sikkim, now a province in Northeast India, lies in the foothills of the Himalayas. 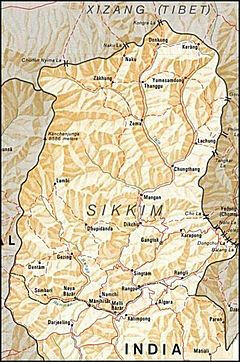 Sikkim, now coded as India [SK for reference only], is a small, mountainous, Indian state (7,096 km2). With its unique culture and natural landscape, Sikkim is a picture of perfection and pristine purity. Nestled in the Himalayas and endowed with exceptional natural resources, Sikkim is a hotspot of biodiversity and development. Elections to the first state council was held in mid-1953. Candidates for the council had to be at least 30 years of age and the eligible age for voting was 21. The two important participants in the election were the Sikkim State Congress and the National Party. All political parties in the State of Sikkim contested elections more or less with the same programs i.e. based on the basic issues of Sikkim such as seat reservation, recognition of Nepali language and to promote cordial Centre-State relations. The main political party in the state currently is the Sikkim Democratic Front (SDF) founded in 1993 by Shri Pawan Kumar Chamling , the current CM of the state. The party has consistently won the state assembly elections since 1999. It won 31 seats in 2004 and made a clean sweep in 2009, winning all 32 seats in the state assembly. It has also retained the parliamentary seat in the 2009 general elections. Assuring its commitment to conduct free and fair assembly and parliamentary polls in Sikkim, Election Commissioner Naveeen Chawla on 03 April 2009 said that they will 'micro manage' the conduct of the poll process in the Himalayan state. A number of the preparatory activities for the smooth and successful conduct of General Elections 2014 were taken up during the year 2013-14. Sikkim Democratic Front (SDF) who has been ruling the state since its inception in 1994, continued to rule the state by winning the lone Lok Sabha seat in the 2014 Lok Sabha elections. SDF also won the assembly elections which were held along the Lok Sabha elections in the state. One of the smallest state of the north eastern region of India, Sikkim is represented by a single constituency in the Parliament. The single Lok Sabha constituency was held by the Sikkim Democratic Front (SDF) government since previous elections too. Although, the assembly constituencies are led by the Indian National Congress (INC). The state of Sikkim is headed by a Chief Minister and Pawan Kumar Chamling is the present Chief Minister of the state. Sikkim has major political parties like INC, Bharatiya Janata Party (BJP), Communist Party of India (CPI) etc. but is majorly led by small regional parties like SDF. Sikkim went for Lok Sabha and Assembly polls simultaneously in 2014. SDF who has been ruling the state since its inception in 1994, continued to rule the state by winning the lone Lok Sabha seat. In May 2016, after the BJP led NDA formed its first government in Assam, a new alliance called the North-East Democratic Alliance (NEDA) was formed with BJP leader Himanta Biswa Sarma as its convener. The Chief Ministers of the north eastern states of Sikkim, Assam, Arunachal Pradesh and Nagaland too belong to this alliance. Thus, the Sikkim Democratic Front joined the NDA led NEDA. Pawan Kumar Chamling is the longest standing Chief Ministers of India, who won the legislative assembly elections for 5 terms in a row and would be completing 25 years of governance by the next legislative elections, (2019) creating a political history in India.